Good guy? Bad guy? A blood-spatter expert, for sure! From the hit Showtime television series Dexter. This serial killer action figure is approved by actor Michael C. Hall. Fully articulated. Interchangeable arms. Great accessories! 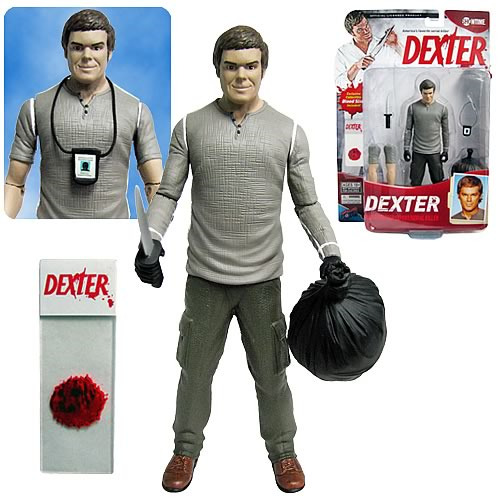 Don't miss this awesome action figure of everyone's favorite so-called "good guy", Dexter! Standing 7-inches tall and fully articulated, Dexter comes with interchangeable arms, allowing him to transform from killer to blood-spatter expert and back again. He also includes loads of great accessories: knife, body bag, ID badge, and blood slide! He would love to make your world a safer place, so bring him home today! This sculpt is personally approved by Michael C. Hall and Showtime. Skip ahead to 1:22 to see Michael C. Hall talk about the figure!